Throughout the 2010 campaign cycle, Republicans capitalized on the struggling economy to bolster their case for election, promising to focus all their political efforts on job creation. Yet when the GOP assumed the majority in the House of Representatives, it quickly became clear that their "top political priority" — as Senate Minority Leader Mitch McConnell (R-KY) admitted — was to "deny President Obama a second term." As such, the GOP, particularly in the House, has spent its legislative time on anything and everything but measures to help the struggling economy get back on its feet or to spur job creation. Instead, they've introduced bill after bill on hot-button issues, particularly women's reproductive health; they've dragged the economy to the brink of disaster by playing political games with the debt ceiling; they've done their best to undermine the social safety net by proposing cuts to Medicare, Medicaid, and food stamps; and they've tried over and over to repeal or deny funding to the landmark Affordable Care Act. Even worse, a number of the measures House Republicans have proposed would actually destroy jobs: In an effort to cut spending and reduce the deficit, the GOP has pushed legislation that would undermine the economy. According to estimates by economists and experts, a number of measures passed or introduced by House Republicans in 2011 would, if signed into law, potentially eliminate up to 7.4 million jobs. 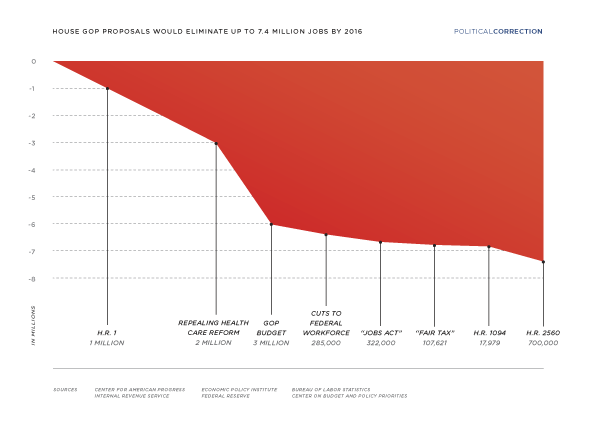 Click HERE to read about what the GOP has spent time on in 2011 instead of job creation. Click HERE to read about how House Republicans have spent 2011 cutting jobs.